Sew what's cooking with Joan! 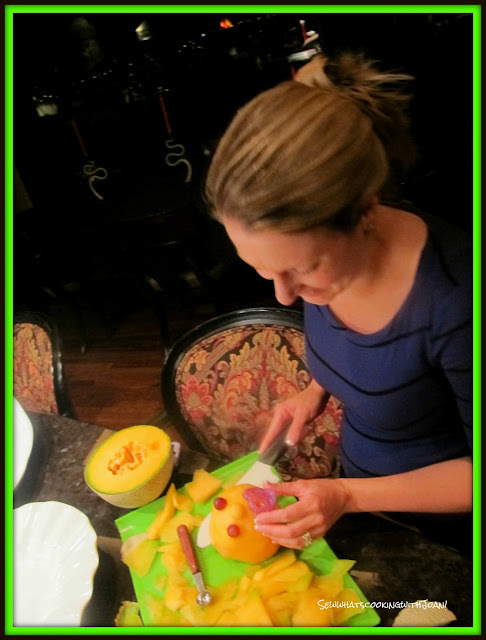 : How to carve a watermelon baby carriage! If you are hosting a baby shower sometime in the future, you may be thinking about cute centerpiece ideas for the main table of your party or for the food buffet. From flowers, balloons, apothecary candy to diaper cakes, there are so many options for celebrating the upcoming birth of a tiny baby. 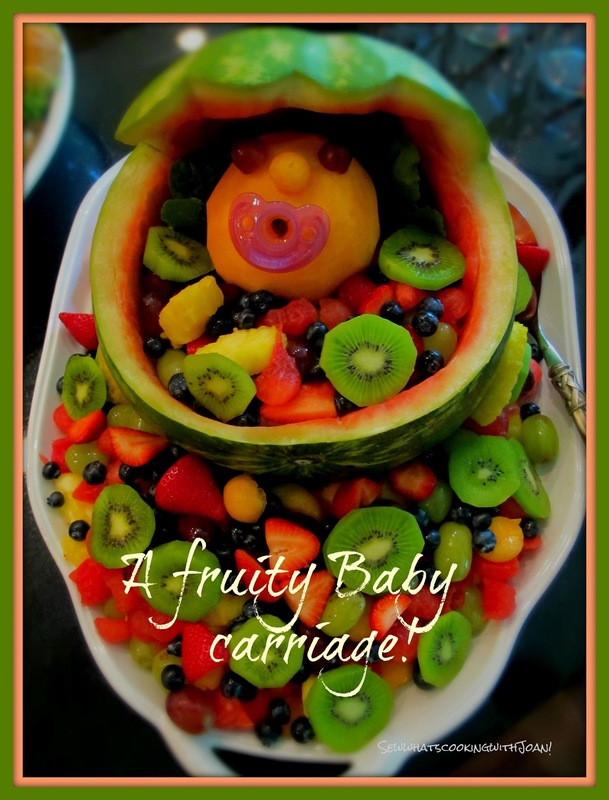 For those of you planning on serving fruit at the party, you should consider making a adorable watermelon baby carriage. This fun centerpiece is really easy to make and guaranteed to make your guests smile. I was helping plan a baby shower with Laura (my step daughter) and Amy(my daughter-in-law) for my daughter, Holly (aka Tink). Laura had seen this on Pinterest and thought it would make a nice addition to the buffet. 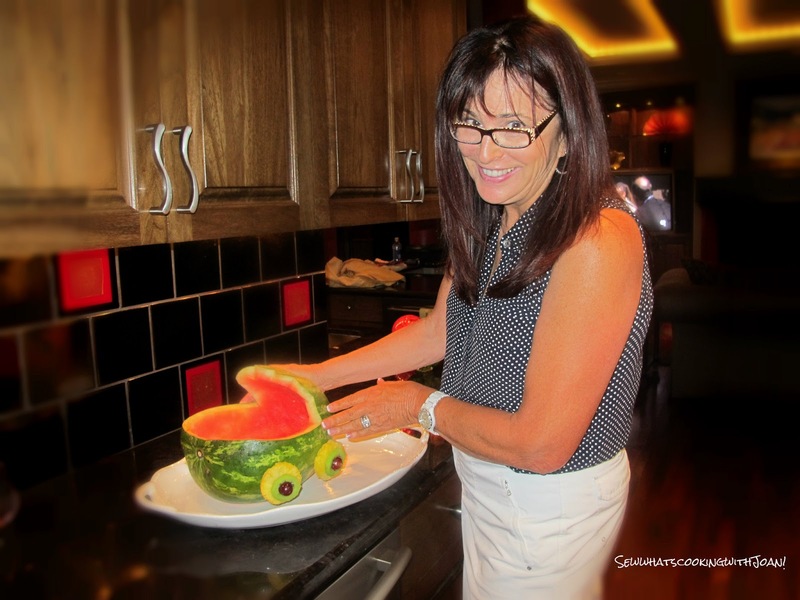 I was given the task of helping to create a watermelon baby carriage. Laura and her husband (my son-in-law) and I all participated. It was easy and turned out really cute! 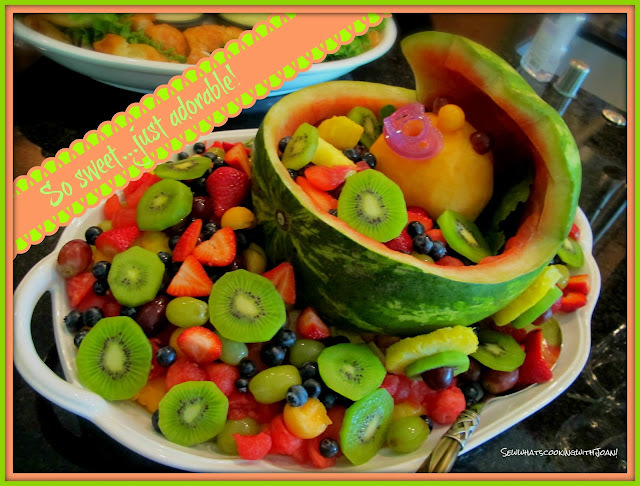 When Amy posted last week pictures of Tink's Jungle themed Baby Shower I was flooded with e-mails, calls and verbal face to face requests for a tutorial on making a baby carriage fruit bowl, with baby! There are many on line, however, my loyal followers wanted my input! The watermelon baby carriage is practical as well as fun in that it is both table decor and a fruit bowl. Use lots of different fruits to give it lots of color. For our centerpiece, we used red and green seedless grapes, strawberries, blueberries, pineapple, cantaloupe, kiwi and of course lots of watermelon. We made our carriage the night before the shower, so the fruit was fresh and kept it overnight in the refrigerator. If the shower is outside, you may want to put a container of ice under the watermelon to keep the fruit from becoming too warm. Place watermelon on baking sheet. Cut a thin layer off to make a stable base for the centerpiece and to prevent it from rolling off the table. Turn watermelon around and use marker or pen to outline the opening of the baby carriage. We opted not to have a handle on our carriage as we felt it blocked the view of babies head and wasn't practical for serving the fruit. However, if you would like a handle on your carriage you will need to draw the outline of the handle on the top of the part you are cutting out, now. Using a sharp knife, cut along the outside of the marked lines. Carefully push knife down about 2 inches and slowly follow outline. 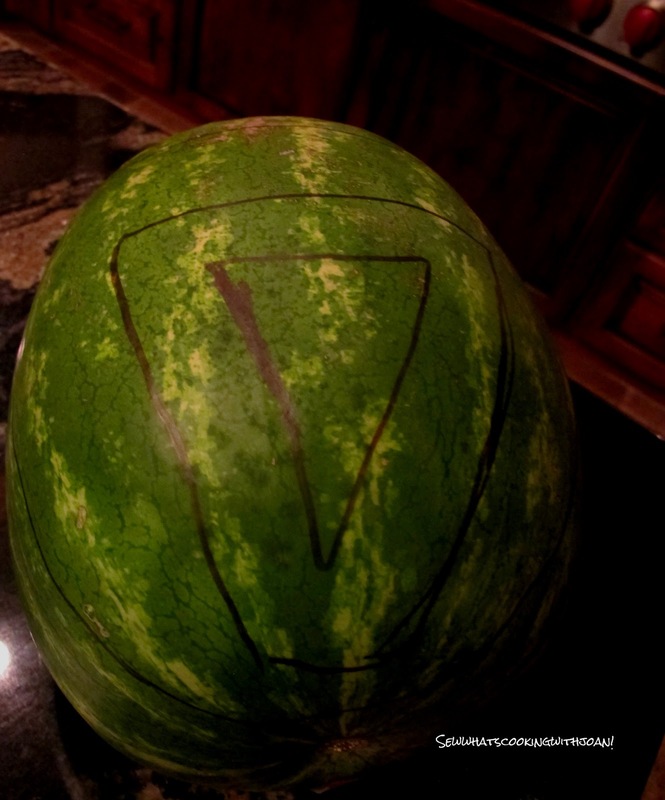 Once the outline is done, cut through the watermelon to be able to detach the top part of the carriage. Gently lift the opening of the watermelon. 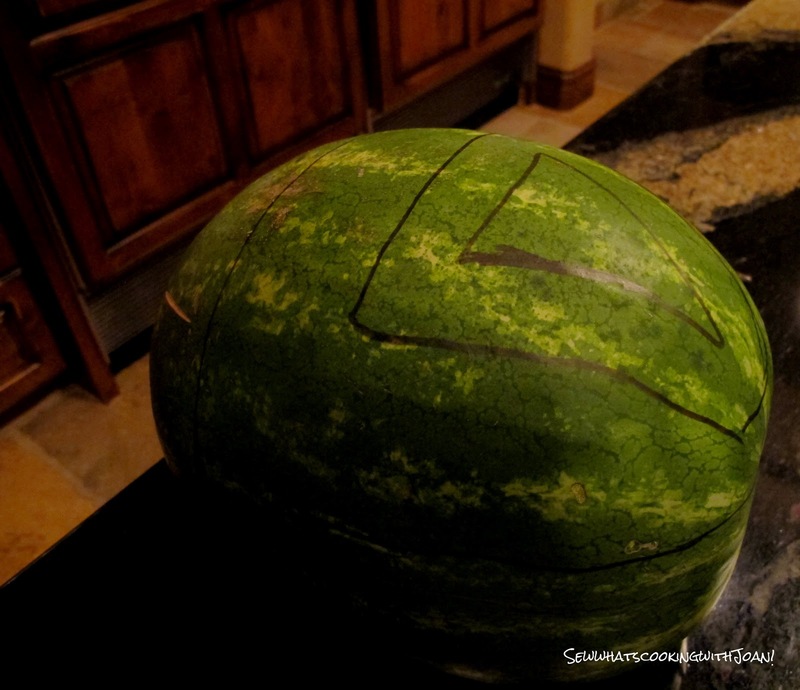 Cut or scoop the watermelon out and put in a separate container. If you did not purchase a seedless watermelon, you will also need to remove the seeds. Keep removing the watermelon until you are left with a thin layer of red along the inside of the carriage. Finish cutting out the carriage handle if you are making a handle out of the top part of the watermelon. To make the wheels, I used a pineapple and sliced across it into 1/2 inch slices for 4 wheels. I then cut the rind/skin off to make the wheel round and pretty. I cut four 1/4 inch slices of Kiwi for the hub of the wheel and cut a 2 red grapes in half for the lug nuts. I secured them to the watermelon with skewers. The head is carved from a cantalope. Halved, seeded and carefully carve off the exterior shell. Make the eyes with red grapes, the nose from a cantalope ball and put a pacifier in the mouth! If you are lucky enough to have help, split up the work! 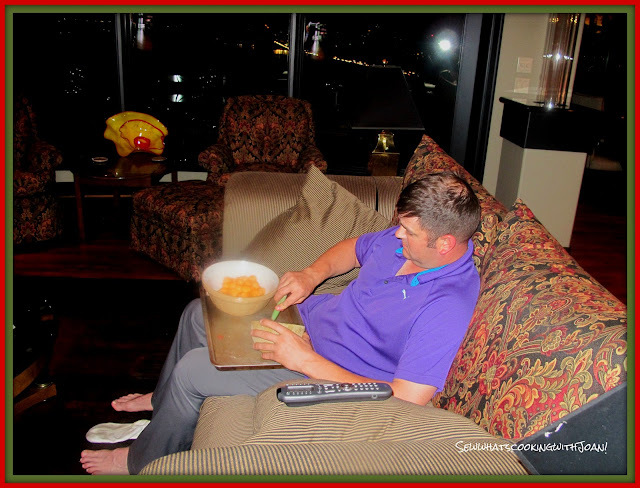 In our case we had Ross, Laura's husband (my son-in-law) captivated with sports on television, so, we handed him a bowl, a baking tray, the melon baller and the melons. He made the balls for our fruit salad! Ross's tip for making melon balls, "Push the edge of the melon baller into the melon pulp and turn"! On the day of the shower, when you are ready to assemble, use a pretty, large platter. Place the carriage on the platter. Put some of the fruit salad into the carriage so that the head of the baby is propped up. Once that is propped up, put some lettuce leaves around to head to form a bonnet. Butter lettuce or field greens will work nicely for this. Then put the remainder of fruit in the watermelon and around the watermelon carriage. This was really fun and our guests all loved it! 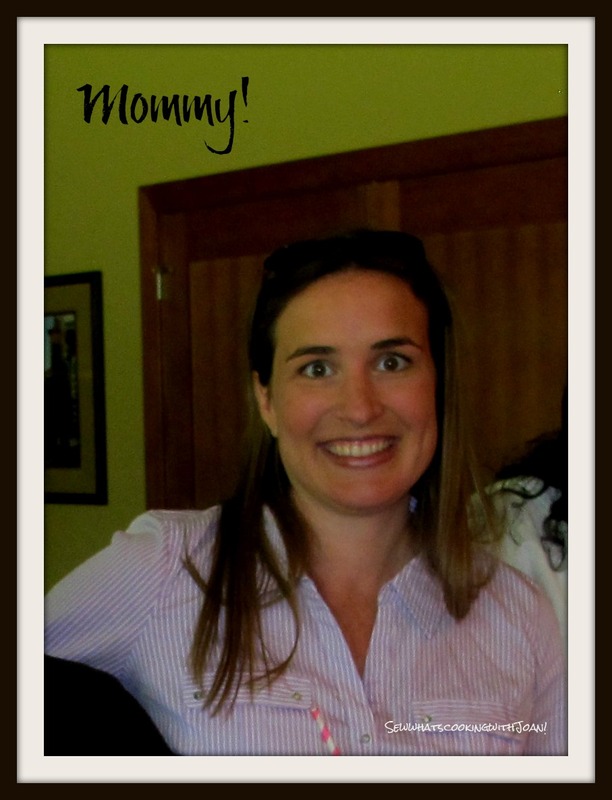 The work isn't too hard and is well worth the effort put forth especially when you see that smile on mommy-to-be's face! Many of us are leaving for a long weekend for the Memorial Day holiday on Friday. I have a new and easy appetizer you can make at your destination, that I will give to you on Friday, along with many other ideas for your celebration! On another note, "Sew whats cooking with Joan" is going to move to posting two days a week, starting June 1. I have contemplated this for a few month's, and have decided with Summer family trips, lot's of babies about to be born, I will have less time for writing. Wee Bear and I are taking "Baby CPR" classes and I have cancelled all my golf tournaments through December in preparation for our grand children's birth. Also, I need to be "On Call", as I have been honored with the request from my darling daughter to support her and hubby in the delivery room. I am so excited , I can hardly contain myself!! Can you make it ahead of time and refrigerate it? Loosely covered in saran wrap or such? Absolutely! We made it the day before, refrigerate and cover loosely with plastic wrap. Fruit can be done ahead too, just put in a zip lock bag.